Taste test: These are kind of strange. 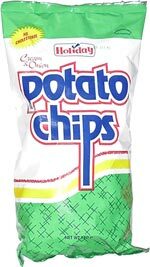 They're not actually potato chips, despite their name. They're actually made from dehydrated potatoes and then molded into shape, rather than actually being "chipped" off the potato. In that way, they're kind of like Pringles. These aren't rippled or wavy chips, but they are very curly and sort of irregular in shape. I liked the fact that they're called "Cream & Onion" rather than "Sour Cream & Onion" — a nice change from the ordinary. They're OK, with kind of a variation on the standard sour cream and onion taste. Smell test: Smell like Asian snacks. This snack was discovered by Jim O'Brien (but not the basketball coach) in Barbados. Review published .